A positive candidate experience can be the difference between the right person accepting your role or taking their talent elsewhere. Recent research from the Talent Board shows that there’s a strong correlation between a company’s candidate experience and their business outcomes. 46% of job seekers who give their overall candidate experience a 1-star rating say they’ll take their business elsewhere. So, how do we focus on creating a great candidate experience? By humanizing the process, start to finish. 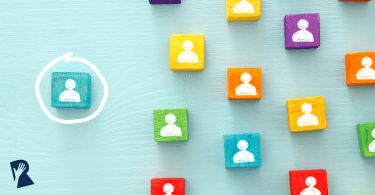 Improving the candidate experience to make it more “human” comes down to fulfilling a few basic human needs: ensuring candidates feel heard, responded to and respected. To meet these needs, employers should keep in mind the expectation of today’s socially engaged and digitally connected candidates. Candidates expect employers to be authentic and transparent in their communications, and to be always available and easily accessible. 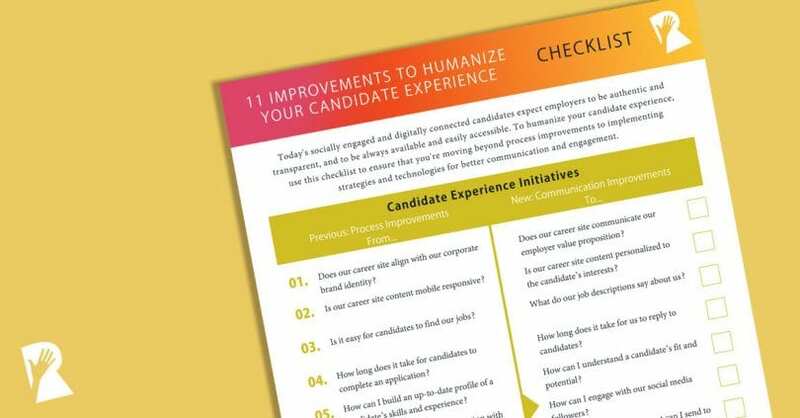 You can keep your talent acquisition strategy competitive by using our Checklist on 11 improvements to humanize your candidate experience. Previous focus on process improvement: Does our career site align with our corporate brand identity? New focus on communication improvement: Does our career site communicate our employer value proposition? Previous focus on process improvement: Is our career site mobile responsive? New focus on communication improvement: Is our career site content personalized to the candidate’s interests? Previous focus on process improvement: Is it easy for candidates to find our jobs? New focus on communication improvement: What do our job descriptions say about us? Previous focus on process improvement: How long does it take for candidates to complete an application? New focus on communication improvement: How long does it take for us to reply to candidates? Previous focus on process improvement: How can I build an up-to-date profile of a candidate’s skills and experience? New focus on communication improvement: How can I understand a candidate’s fit and potential? Previous focus on process improvement: Can candidates submit an application with their LinkedIn and Facebook profiles? New focus on communication improvement: How can I engage with our social media followers? Previous focus on process improvement: How can I send job alerts to generate more applications? New focus on communication improvement: What relevant careers content can I send to stay top of mind? Previous focus on process improvement: How can I route inquiries to a centralized mailbox? New focus on communication improvement: How can we communicate with candidates one-on-one in real time? Previous focus on process improvement: How can technology automate processes to scale our operations? New focus on communication improvement: How can technology automate processes to help me build relationships? Previous focus on process improvement: How quickly and accurately can we screen and assess applicants for hiring managers? New focus on communication improvement: How quickly and transparently can we tell applicants where they stand? Previous focus on process improvement: How can I capture interview feedback from the hiring team? New focus on communication improvement: How can I collect and analyze feedback from candidates about their experience? 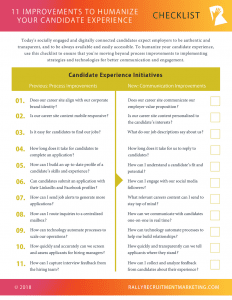 Our Checklist on 11 improvements to humanize your candidate experience will help ensure that your organization is taking a modern approach to candidate communications. Download the checklist here. 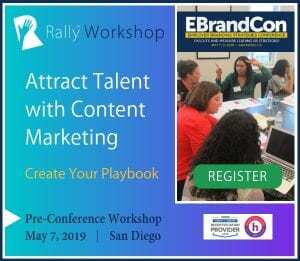 Get the Rally™ Ideabook: 11 Ways to Humanize the Candidate Experience to get our complete tips on streamlining processes and improving communications. Watch RallyFwd™ On Demand: Humanize the Candidate Experience. 10 expert video presentations. 99.5% of attendees would attend again! Old School Cool: Recruiting Events Still Work! 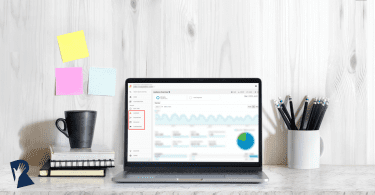 The RallyRM team is building the largest online community for people who are interested in learning and sharing the best ideas in Recruitment Marketing.